The discovery of novel therapies for a disease often begins with identifying the cellular and biochemical target whose malfunction is implicated in the initiation or progression of the disease. Because abnormally high or low activity of proteins (receptors, enzymes, or transporters) or of the genes that code for these proteins is the underlying cause of most diseases, therapeutic intervention requires modulation of the target protein or gene activity by chemical agents. Identifying the chemical agents that can modulate activities of specific proteins or genes with a high degree of selectivity and potency through rational design or high throughput screening with combinatorial libraries has become a less daunting task in the past two decades. 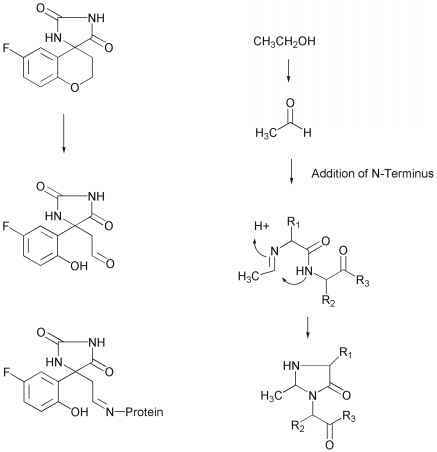 This is because most proteins can be readily expressed, isolated, and structurally characterized, their functional activity can be assessed using in vitro systems, and vast numbers of compounds can be synthesized using combinatorial approaches as potential modulators of their expression or functional activity. However, it is important to recognize that the therapeutic efficacy of these agents in humans can only by achieved if sufficiently high concentration of these compounds can be attained and maintained at the target site. This requires that the compound has appropriate physicochemical properties so that (i) it can be absorbed effectively from the site of administration (e.g. gastrointestinal tract for orally administered compounds), (ii) it escapes extensive metabolism in the liver and other extrahepatic tissues, (iii) it is distributed sufficiently in the target tissue, and (iv) it is not excreted too rapidly via the renal or the hepatobiliary clearance mechanisms. Thus, the physiological processes involved in the absorption, distribution, metabolism, and excretion (ADME) of a compound are important determinants of its therapeutic efficacy. Therefore, physicochemical properties of compounds should be optimized not only with respect to their potency and selectivity for modulating the target protein or gene, but also with respect to their ability to overcome barriers posed by the ADME processes in achieving optimum concentration at the target within the human body. Thus it is not surprising that studies designed to assess and optimize the ADME properties have become an integral part of the drug discovery process in most pharmaceutical companies. As a result, clinical failure of lead compounds due to adverse ADME properties (Caldwell et al., 2001; Kerns and Li, 2003) has declined from 30-40% (Kennedy, 1997) to ~10% in recent years (Biller, personal communication at AAPS workshop on Pharmaceutical Profiling in Drug Discovery for Lead Selection, 2003). However, it is important to note that the approaches used to assess and optimize the ADME properties of compounds and the extent to which these approaches are integrated in the lead optimization process vary significantly among companies in the pharmaceutical industry. In this chapter, tools and strategies for assessing and optimizing ADME properties of lead compounds are discussed. The goal of this review is not to provide a comprehensive catalog of all the in vitro and in vivo ADME models, but rather to focus the discussion on how best to use the contemporary ADME models to assess and optimize the ADME properties for the purpose of identifying or designing discovery leads that would perform well in the clinic. In order to ensure that the lead candidate will have optimum ADME properties in humans prior to any clinical testing, it is important to have model systems that can serve as surrogates for human ADME processes. Historically, ADME properties have been evaluated in preclinical species such as rodents, dogs, primates, etc. by conducting pharmacokinetic (PK) studies, and extrapolated to humans based on the PK parameters obtained in several preclinical species (reviewed in Rowland, 1985; Obach et al., 1997). This approach suffers from two major pitfalls as it pertains to lead optimization. Firstly, these studies are laborious and time-consuming, and therefore they do not allow evaluation of sufficiently large number of compounds. Second, the prediction of ADME properties in humans is often wrong because the selectivity and activity of transporters and enzymes associated with the ADME processes can be quite different across different species. Over the past several years, advances in molecular biology techniques have made it possible to clone and express drug metabolizing enzymes and transporters of human origin. These proteins and cells of human origin are employed as in vitro systems to assess ADME properties of drug candidates (reviewed in Maurel, 1996; Iwatsubo et al, 1996; Obach et al., 1997) with the anticipation that such models will be more predictive of ADME processes in humans. However, it is important to recognize that these in vitro systems measure ADME properties of compounds in a relatively simple environment that is very different from the complex in vivo environment where several different enzymes, transporters, and physiological processes compete with each other. Hence, these in vitro systems often fail to predict ADME properties (e.g. metabolic clearance) of compounds in humans despite the fact that they employ enzymes and transporters of human origin. Figure 1. Determinants of oral bioavailability and a decision-tree to assess their role. preclinical species can be applied to the in vitro models of human origin, leading to better prediction of the ADME behavior of the drug candidates in humans. The initial PK studies in preclinical species with a small number of compounds within a lead series yield parameters, such as oral bioavailability and clearance, which allow overall assessment of the ADME-related problems associated with the lead compounds. Thus, if compounds in a lead series yield low oral bioavailability (e.g. <10%) or short half-life (e.g. < 30 min), it is obvious that physico-chemical properties of these compounds need to be refined to improve these PK parameters. However, before attempting any refinement of the chemical structure of these compounds, the underlying causes for inadequate oral bioavailability or short half-life should be identified. Thus, poor oral bioavail-ability of a compound could result from poor absorption or pre-systemic (first-pass) removal of the compound by metabolism in the intestine or by metabolism and/or biliary excretion in the liver (Figure 1). Poor absorption could result from poor solubility of the compound or from poor intrinsic permeability across intestinal epithelium (Figure 1). Similarly, the short half-life (or high clearance) of the compound may suggest that the compound is either cleared rapidly via metabolism or excretion via the biliary or the renal route. Teasing out the underlying factors for poor oral bioavailability or short half-life often requires iterative use of PK studies and in vitro models. The following examples will illustrate this point. If an acidic compound is orally administered as a soluble salt and yields low oral bioavailability, it is likely that the compound precipitates in the acidic environment of the stomach and does not re-dissolve easily even as the pH of the medium rises during intestinal transit. This solubility behavior can be reproduced using in vitro approaches, thus providing credence to the hypothesis that poor solubility is contributing to the low oral bioavailability of the test compound. However, it would be important to confirm this by comparing the bioavailability of the test compound upon oral administration and intraduodenal administration. Since the latter route of administration does not allow the drug to precipitate in the stomach, the bioavailability should increase in comparison with the bioavailability after oral administration. In another example, let us assume that poor bioavailability of a drug candidate is suspected to be due to first pass clearance. This should trigger a follow-up in vivo study in which the oral bioavailability of the compound is tested after oral (or intraduodenal) and portal vein dosing. The portal vein receives venous blood supply from the mesentery and thus the entire does of a drug absorbed from the intestine will end up in the portal vein before entering the liver. 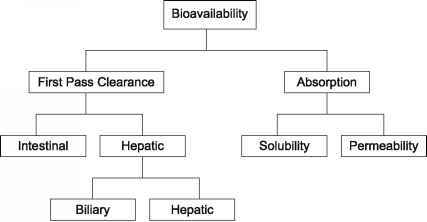 If the bioavailability is similar (low) upon oral (or intraduodenal) dosing and portal vein dosing, then it can be surmised that liver must be the site of clearance that led to poor bioavailability. However, if the bioavailability increases upon portal vein dosing (in relation to intraduodenal dosing) then it can be concluded that intestinal epithelium must be the site of clearance. Depending on the site (organ) of clearance postulated based on these studies, appropriate in vitro models (e.g. microsomes, cell homogenates, cells) derived from either intestinal or hepatic tissue can be employed to confirm the underlying mechanism that is responsible for the low oral bioavailability of the drug. Once these factors are identified, then appropriate in vitro models can be implemented to screen for compounds for specific ADME properties (i.e. metabolic stability, permeability across intestinal epithelium, biliary excretion). Such screens not only help identify compounds with "good" ADME properties and weed out poor performers, but they also yield structure-activity relationships with respect to the specific ADME property that is being screened. Such relationships are extremely valuable in refining chemical structure and physico-chemical properties of compounds for optimum ADME behavior. While the in vitro models are valuable for screening large numbers of compounds against specific ADME properties and for developing structure-activity relationships, it must be recognized that the refinement achieved in these ADME properties using the in vitro models may not always translate into improved ADME behavior in vivo. Hence, it is important to confirm that the in vitro model chosen is predictive of the in vivo ADME behavior before committing to an extensive screening effort. In the following sections, discussion will focus on the use of in vitro models to address ADME-related problems that have been identified using preclinical PK studies.